Solar Protection Screens has installed tens of thousands of screens and built a reputation for attention to detail. We treat every one of our customers with respect and care. We are happy to provide answers to any questions you may have about our company and our product. Please continue reading to see our frequently asked questions. For more information, please contact us. Q: How much will solar screens save me on my electric bill? A: There is no way for anyone to give you a specific and accurate figure; there are too many variables. How many windows are in your home? How was your home constructed? Does the house face west? However, solar screens will dramatically reduce summer cooling and winter heating expenses—without question. For example: a two-story house facing east to west will see a return on investment in two years; a one-story house in about three. Q: Should I use the 80% or the 90% sun screen? A: If you want more light, better airflow and visibility, you should purchase the 80%. If you want more glare reduction and energy efficiency you should go with the 90% model. You may want to put the 90% model in areas where heat and glare are most problematic and the 80% model on the remaining windows. This affords you more control over rooms in which you want more natural light and rooms that generate the most heat. It is recommended that hotter upper-level windows use the 90% model while tree shaded or awning rooms use the 80%. Q: Will solar screens block my view? 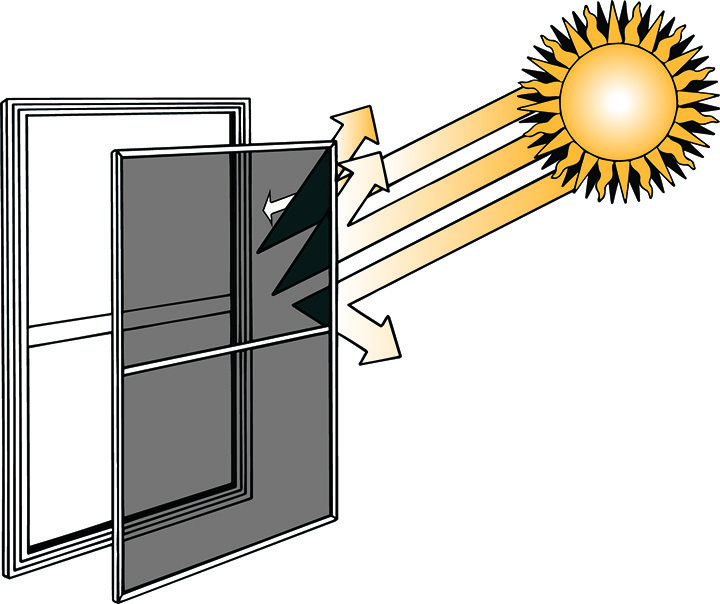 A: Solar screens will allow full outward visibility without the sun’s harsh glare. Imagine looking out through tinted sunglasses. This is the general quality of vision our screens allow. It is like looking through a regular window screen, only a little darker. Q: Will my solar screens pay for themselves? A: Yes! Solar screens save so much in energy costs that they normally pay for themselves within a short period of time. They also extend the longevity of air-conditioning units and furnaces by reducing their workload. Appliances are more efficient when they only have to endure a 10-20% heat gain. Reduced strain on your machines will save you money on repair costs in addition to reducing energy use. Q: Do solar screens really work? A: Yes, they are the most energy efficient product on the market for your windows. They are mounted outside of the glass, creating a thermal blanket that blocks the summer heat and the winter cold. Q: Solar screens or film tint? A: Film is an interior application and is not designed for your double pane windows. It is not nearly as effective as exterior solar screens and voids all window warranties, as it damages sealed thermal pane windows. Film is permanent and is not scratch resistant. It is more expensive than exterior shading and is also not as effective at reducing heat gain as Solar Screens. We have added solar screens to many tinted windows to provide necessary heat control. Q: Will solar screens reduce fading? A: Yes, solar screens will drastically reduce the fading of floors, curtains and furniture by blocking UV light. Q: What is the warranty on solar screens? Q: Do you make the screens? A: No, we do not manufacture your screens ourselves. We are a Phifer representative installer. All of our orders go through a Phifer authorized manufacturer and delivered to us on weekly schedule. Q: What windows or doors on my house should I screen? A: For maximum energy efficiency, shade the entire house, including glass doors. This will ensure maximum heat gain reduction. If you only choose to shade problem areas, then unprotected glass may negate the cooling effect of shaded windows. If you prefer to gradually install shades, consider this: hotter upper levels, bedrooms and windows regularly exposed to sunlight should be the shading priority.